A hot glue gun is a very handy tool to have when using the double direct method to make your mosaics. I use it to glue my pieces of tesserae onto my mosaic tile mesh. It dries very quickly and forms a very strong bond. Whenever I need to glue mosaic tiles on a fiberglass mesh I use hot glue. The bond is strong enough to roll up and carry my mosaic around when I am finished with it. 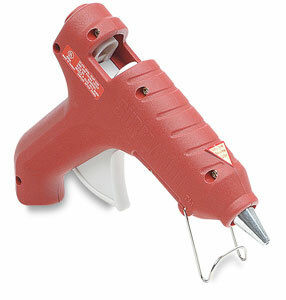 A hot glue gun is a very useful and inexpensive tool to have when making mosaics. Just a little note of caution however, they can become very hot so be very careful not to burn yourself! This trigger-fed glue gun is equipped with a control switch that allows you to melt glue at either high or low temperature settings. 120V. 60 Hz. UL listed. These clear glue sticks can be used with either low temperature or high temperature glue guns. Each stick measures 7/16" in diameter. Available in either 4" or 10" long sticks.